The Nightingale takes place in 1825 on the British colony of Van Diemen’s Land, which is now known as Tasmania, Australia. 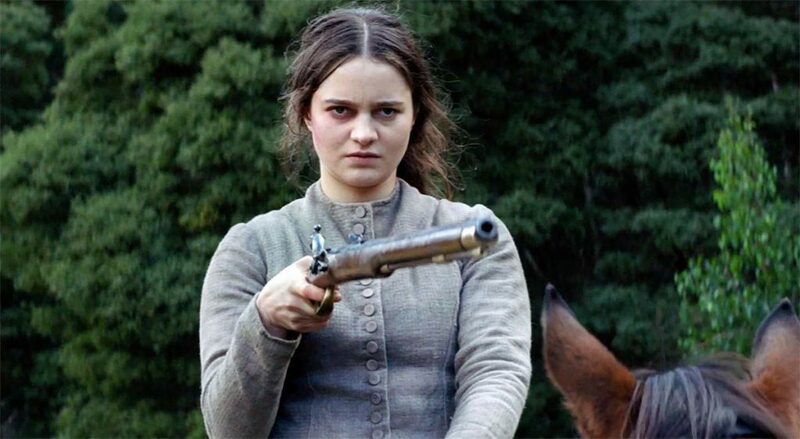 The Film follows the story of a young Irish convict, Clare (Aisling Franciosi), who is serving time in order to be given her ticket to go back home by British officer Hawkins (Sam Claflin). One night, Hawkins and fellow officers, under his directives, commit horrific acts of violence against Clare, her husband, and their newborn child. This sets her out on a hunt, with the help of Aboriginal guide Billy (Baykali Ganambarr), through the wilderness to find them and exact her revenge. This is a harrowing effort for Writer-Director Jennifer Kent (The Babadook). Kent never shies away from the traumatizing acts these men repeatedly carry-out. She forces the audience to watch with great anxiety and feel every ounce of pain Clare is experiencing. It isn’t only Kent‘s pays meticulous attention to details in creating an atmosphere. Her focus is the injustice the indigenous people and women convicts faced. We get a balanced view between Clare’s perspective and that of the Aboriginal People, particularly Billy, who helps her track down the men who savagely attacked her family. The entire Cast is great, with a breakthrough performance from Franciosi, who we have previously seen in BBC’s The Fall. She is a powerhouse who never seems to run out of steam. She displays every range of emotion from pain, happiness, confusion, fear and rage without having to say a word. Claflin is unlike any other character we’ve ever seen from him. He disappears into the sinister Hawkins, giving one of his most frightening and memorable performances to date. The Nightingale screens at Sundance on Fri., Jan 25 at 8:30PM at The MARC PC, Sat., Jan 26 at 6:30PM at Rose Wagner SLC, Mon., Jan 28 at 11:30PM at Prospector Square PC, and Wed., Jan 30 at 12PM at The Ray PC.